Who wants to read a post about THAT?!? So I needed a recharge. Last night, my husband took my older daughter to basketball practice... this is new for us. Are there any other basketball moms out there? Tell me if there is certain basketball etiquette I need to know ;). Lucky for me, Zana was an eager participant! This sweet little pup has stolen my heart (AND my slippers... like CRAZY for them...my husband wants to know what I put on my feet to make her want them so bad! HA!) Guess I know something I need come Winter :). Lastly, the new Dandy Mail Kit is available in the store today -- November is allllll about being thankful. Order yours today to share some love with someone YOU are thankful for! Lots of great goodies included in this kit!!! I am thankful for my doctor, who prescribed me some antibiotics, and will be REALLY thankful when I am back to my old self! Maybe I'll have to send her this month's card :). What/who are YOU thankful for?? So, it's been a crazy ride since 2015 began. My mom passed away in January, somewhat unexpectly, and it seems everyone I know has had something major happen to them this year. I often remind myself that while I don't understand it, there's a plan at work here that is bigger than me. I've learned this year that some things just aren't worth getting worked up over. I've learned that there are things I would like to change, and am working on it. You grow from every experience, right? This, is Zana - also known as Zany Zana. She is our puppy! We have had her a little over 3 weeks now. But yes, if you've ever had a puppy, you know that they often require more attention than a newborn! She's a great pup, but often takes me off task....a lot! It's a week later, my desk is STILL a mess, but my girls are healthy, the puppy is still crazy (and I love it). The ice cream is gone (thanks to all of us) but I'm still smiling. I hope you do, too! All quote cards and the coffee mug used in this post came from Just Dandy Studio - be sure to check out all of the fabulous goodies Melissa has to share with you! later in the day than I had planned, but welcome to my blog, and the first to feature some new goodies from Just Dandy Studio, brought to you by no other than Melissa Bickford! I've been a fan of Melissa's style for years, when she was designing stamps, and now that she's started this new venture, I'm excited to see what is coming next! 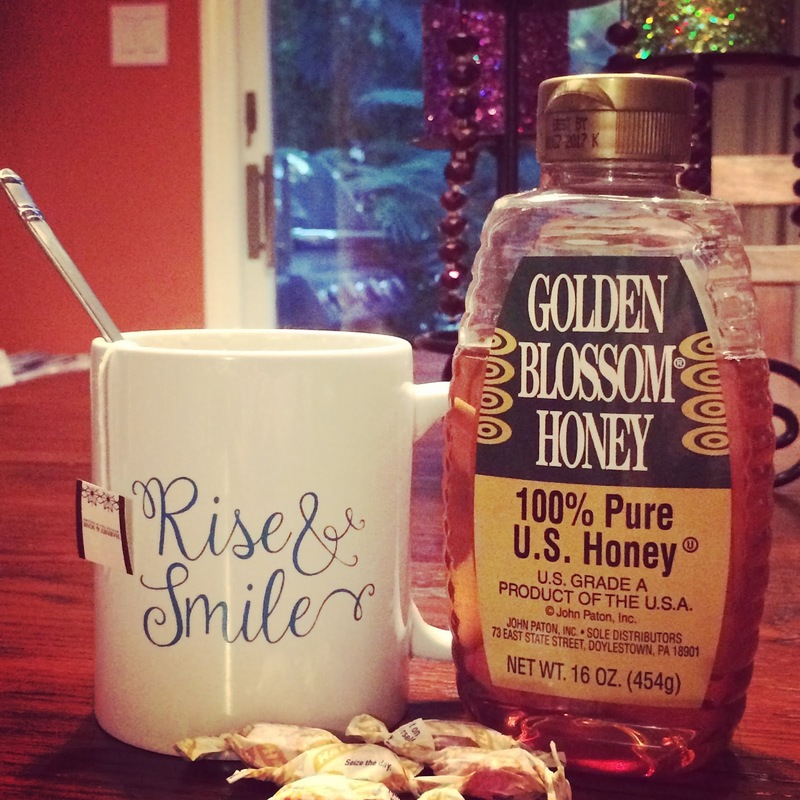 Bright, cheery, coffee and fun! I am a HUGE coffee fan, I definitely drink more than I should, but it's so warm, creamy, mmmmmmm, happiness in a cup! Super fun that Melissa has this great mug up for sale, and I have a feeling there are more to come! It's a GORGEOUS sunny day here in NY, and I happen to be home from work, because my 7 year old is sick with a virus. 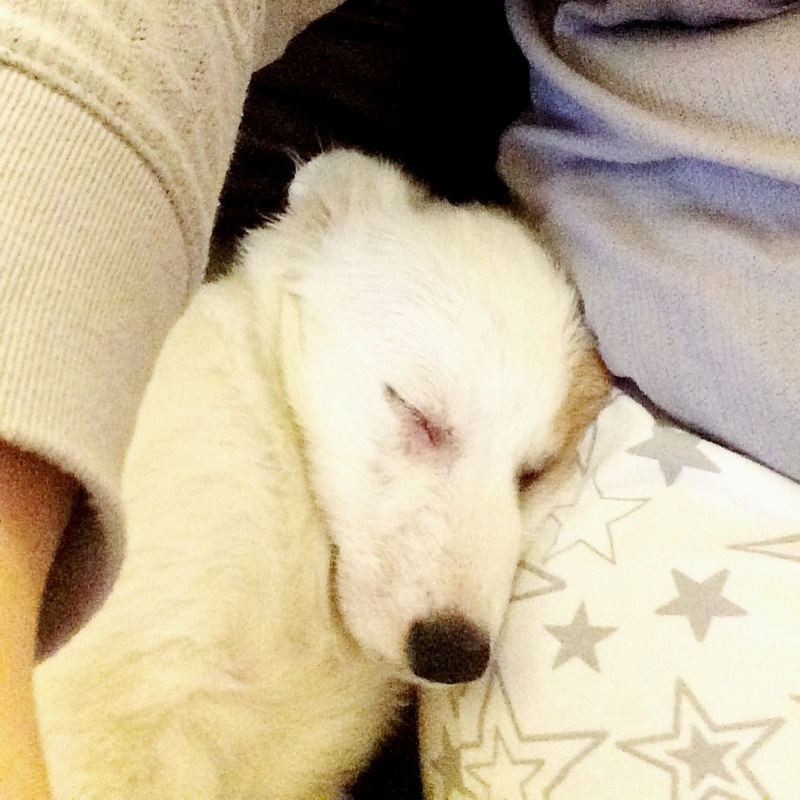 (I certainly don't mind the snuggles from her AND our puppy who joined our family a little less than 3 weeks ago. Her name is Zana, and we're totally in love!! (Check out my Instagram account for photos of her!). Love the bold font with such great messages! 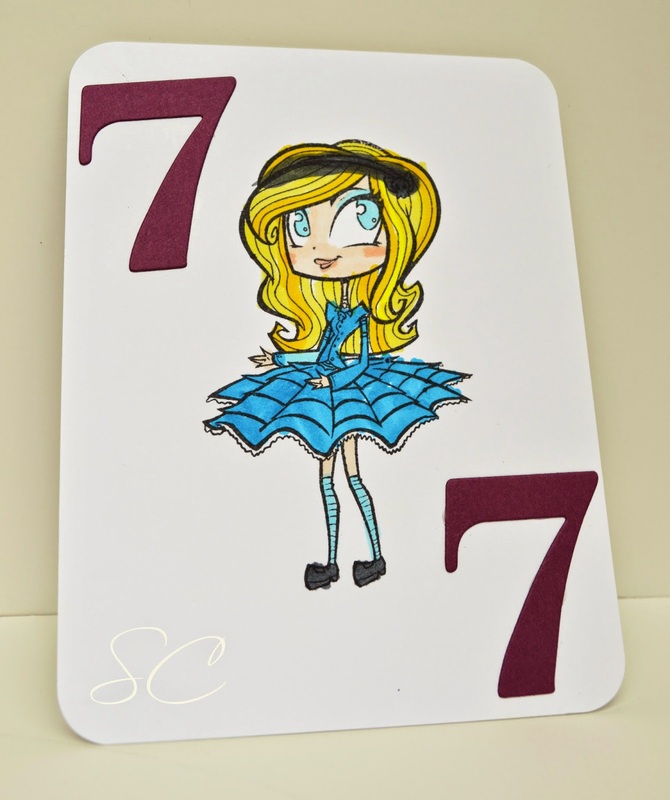 And they're perfect to add to a card front, or tuck it into your husband's pocket with a note, your kids' backpacks, really, there's no limit! I'll have some more to share in days to come, but in the meantime, thanks for stopping by!!! 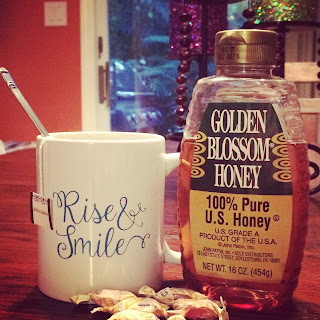 Long time, no blog!! That will all be changing, and soon!! Melissa Bickford has given me the opportunity to be a part of her team over at Just Dandy Studios. 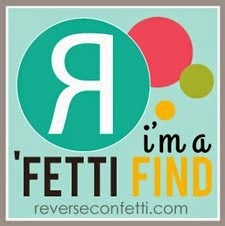 I've neglected the old blog for TOO long, so I am looking to get back in the habit. I seem to go in spurts, posting to the blog here, but I REALLY am going to try to keep this a consistent thing. It's pretty amazing, how easy it can be to neglect writing new posts. 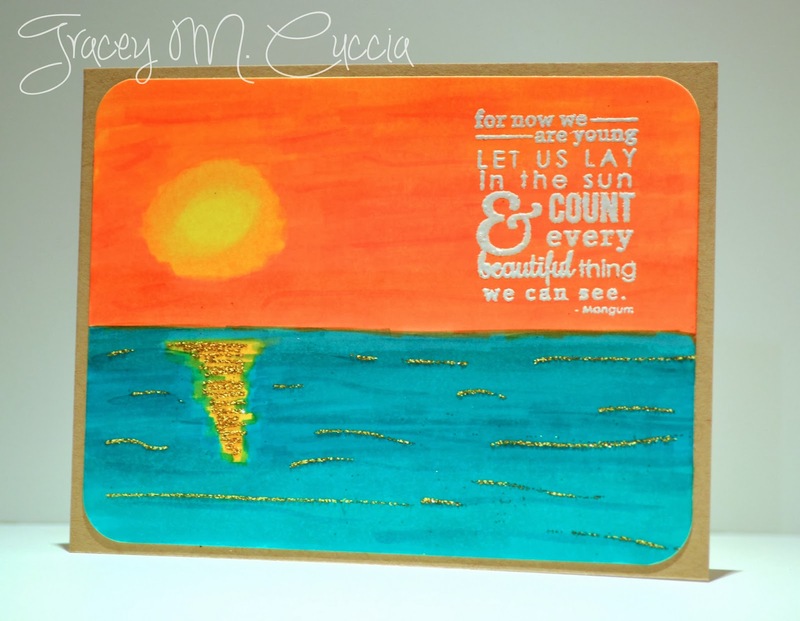 Today, I am sharing a card I made for one of my nephews. I saw a similar design (and I apologize, because I now can not find the original source) and I thought it would be a great 'boy' design. I pulled out my papers, inks, stamps and dies and got myself ready to create a masterpiece! Alright, well, maybe not a MASTERPIECE, but the birthday boy liked it, so all good in my eyes :). I started out with a Tropical Teal base, if you've never used Papertrey Ink's Cardstock, it is heavenly - nice and thick and sturdy, love it! On the white layer, I stamped some images from Grunge Me in Kraft ink, to anchor the focal point. 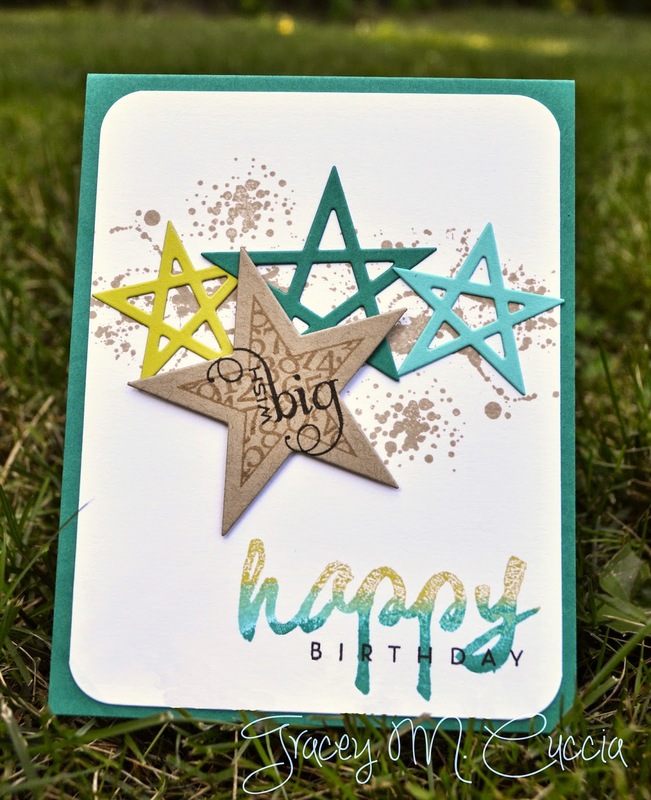 Next, I die cut some stars using the Sketched Stars dies, in a few different colors (Hawaiian Shores, Simply Chartreuse, and Tropical Teal), and on top of that, I placed a Kraft star, stamped with images from Star Prints, die cut with the Seeing Stars dies. 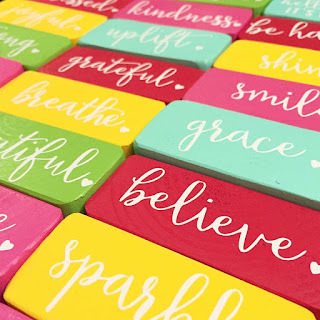 To add my sentiment, I used the 3 colors of ink that coordinated with the die cut stars, and made an 'ombre effect' on the 'happy' from Wet Paint - and finished off the sentiment with True Black ink. Off to another birthday party today -- with a family as big as ours, we're BOUND to be headed off to a party on any given weekend, lol... Thanks for stopping by!!! I came by to share this card with you that I made this past weekend. My neighbor is turning 7, and wanted an Alice in Wonderland party. I thought long and hard, and the idea hit me! 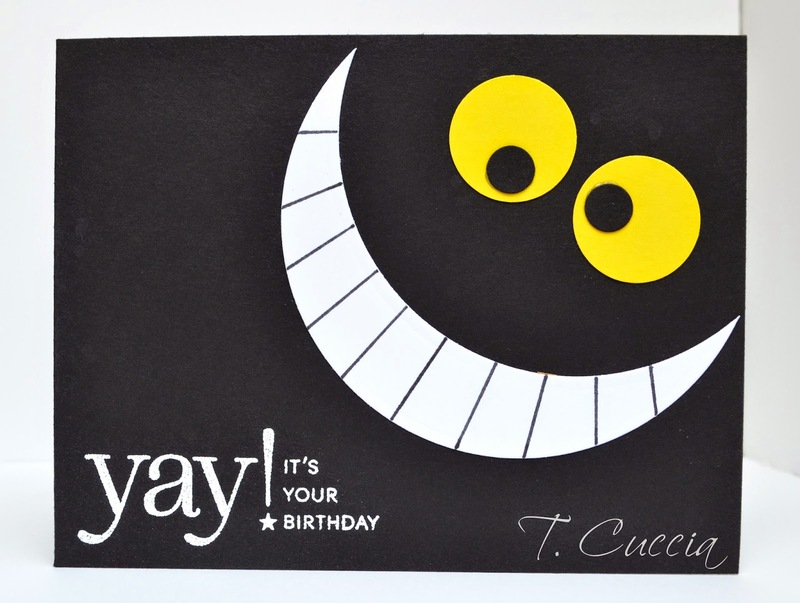 How about a card with the Cheshire Cat?? You know, when we first meet him, in the dark?? YUP! I can do that! lol. I broke out my punches, and my large circle nestabilities, and got to work. 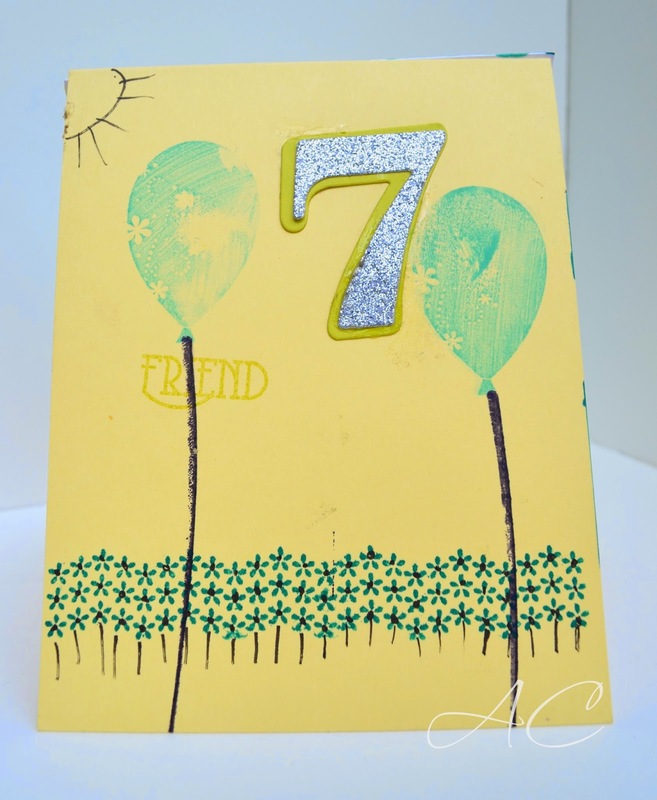 Here's the front -- the sentiment is from Papertrey Ink's Stylish Sentiments: Birthday. Ok, so that came out kind of cute -- used a thin line black marker to draw his teeth. Next, on to the inside! I drew his tail freehand on an old piece of Orchid Opulence CS from SU!, and cut it out, then added some strips of Rich Razzleberry (Also SU!) to make the stripes on his tail. The sentiment inside are cut from various Papertrey Ink Dies. This has GOT to be one of my favorite cards that I have made recently...just fun. My girls each made something too - A made her card 2 months ago in anticipation of this day, so she was disappointed that hers wasn't Alice themed, but I thought she did a great job. 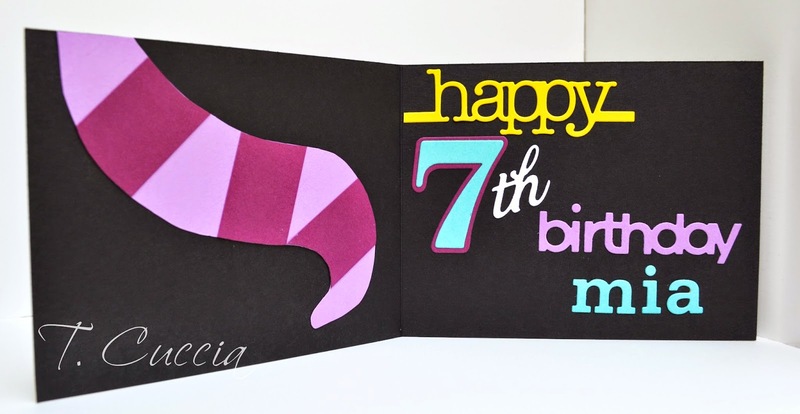 The only thing I helped with was die cutting the '7'. A lot of fun we had with this birthday!! :) Thanks for stopping by!! Lay in the Sun...Reverse Confetti Color Challenge! It feels SO good to be crafting again!!! Thanks to everyone who commented on my card for the PTI blog hop the other day, I had a lot of fun, just making something for me :). 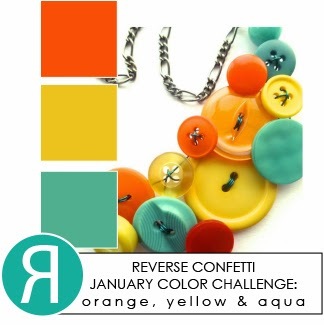 Wellllll, I'm back again today, because as soon as I saw this color challenge over at Reverse Confetti, I was in LOVE. Totally love this color combo!!! A little gold glitter sets off the 'shimmer' in the water...oh, to be in Grand Turk, lol....that's what this color of water reminds me of. Have you ever been there? It's gorgeous. I was fortunate enough to go on a cruise with my entire family the Summer before last, and Grand Turk was one of the stops. It was my favorite. I wish we had more time there than we did. Anyway - thanks Jen for this awesome color combo, and all of the inspiration. The sentiment is from Count Your Rainbows. All content included on this blog is COPYRIGHT ©2008-2013 Tracey Cuccia. 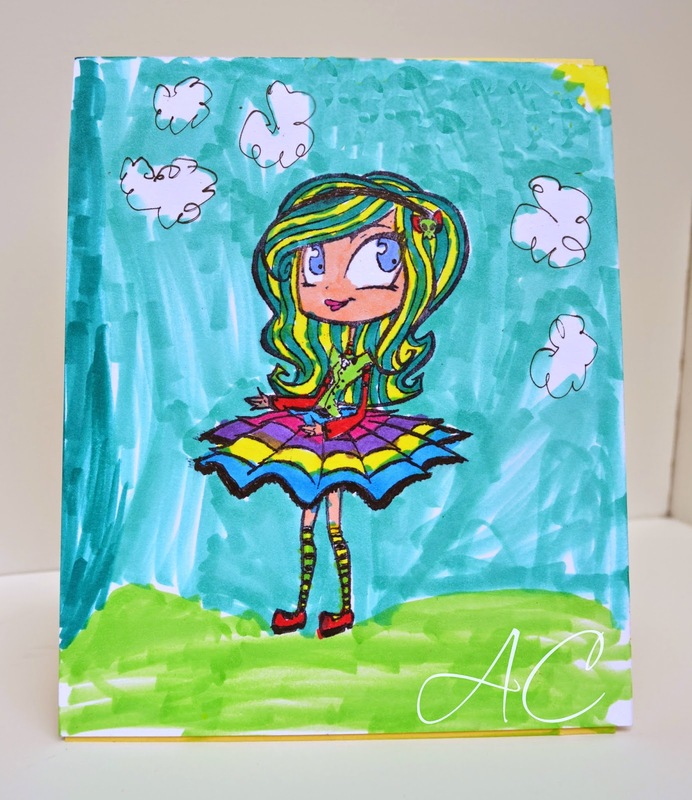 Original artwork is shared for your personal inspiration and enjoyment only and may not be used for publication, submissions, or design contests. My Time to Create Template Challenge! 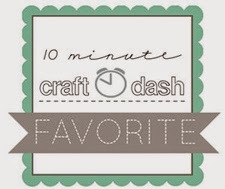 I'm a 10 Minute Craft Dash Favorite! This blog is a personal blog written and edited by me. For questions about this blog, please contact Tracey Cuccia.